Here’s a custom order I made for a customer who wanted a foldover style tote/purse made with the “Edgar” white fabric and coffin flap closure. This one has a zippered front pocket and two magnetic snaps on the body so that the coffin stays closed when it’s folded or as a tote. The adjustable strap lets you wear it 2 ways – either on your shoulder or cross-body. This purse is great for traveling or toting your laptop and books. The fabric design is inspired by the poetry of Edgar Allan Poe. 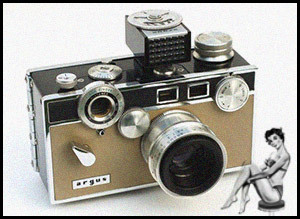 If you have some ideas for a custom order, fill out one of the order forms found here on SabbiesPurses.com. Colorful calacas dance and party and take a paseo under the papel picado banners in celebration of Day of the Dead. New purse now available with adjustable strap so you can wear it to the length you feel most comfortable. Click here for the listing for this purse. Happy New Year! What a better way to ring in the New Year than to get a new purse? This new body design features a front zipper pocket that stretches all the way across the front. The pocket is lined with black cotton fabric, just like the inside of the purse. This bag also features an adjustable strap with sliding buckle so you can wear it at the length that is the most comfortable for you. Find the listing for it here in my store. Inspired by the poet Edgar Allan Poe, the fabric that this purse is made with features old-fashioned handwriting and illustrations of ravens, writing pens and other decorative images. Black coffin flap with magnetic snap closure underneath and light gray ribbon bow. Zipper closure. Find the listing for this purse here. 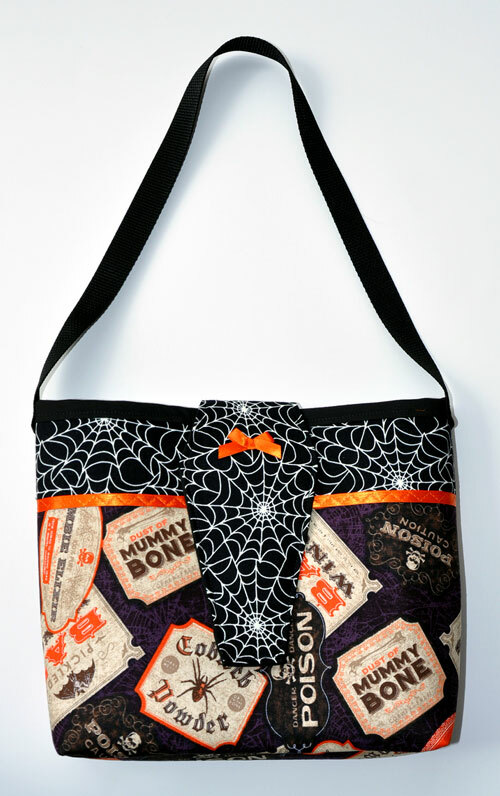 Another custom order coffin flap purse, this one with vintage Halloween labels and glow in the dark cobweb fabric. 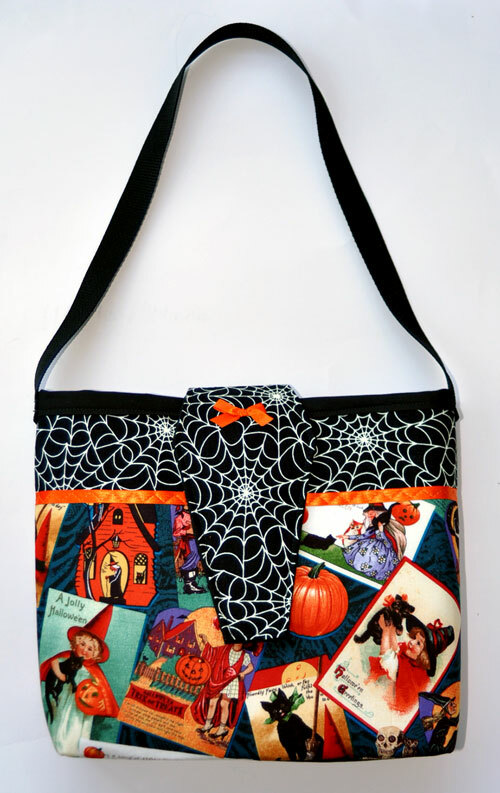 Custom order made with vintage Halloween greeting cards fabric and glow-in-the-dark cobweb fabric coffin flap. Orange satin ribbon trim, and a bow sewn on the flap. 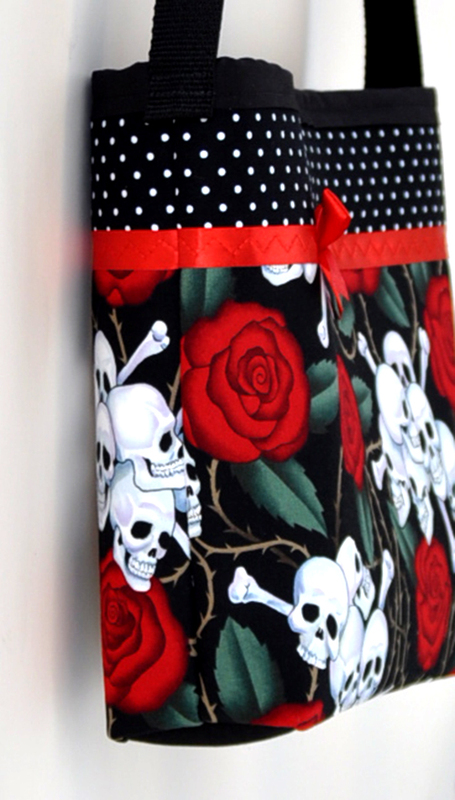 Skulls and Roses fabric by Alexander Henry. 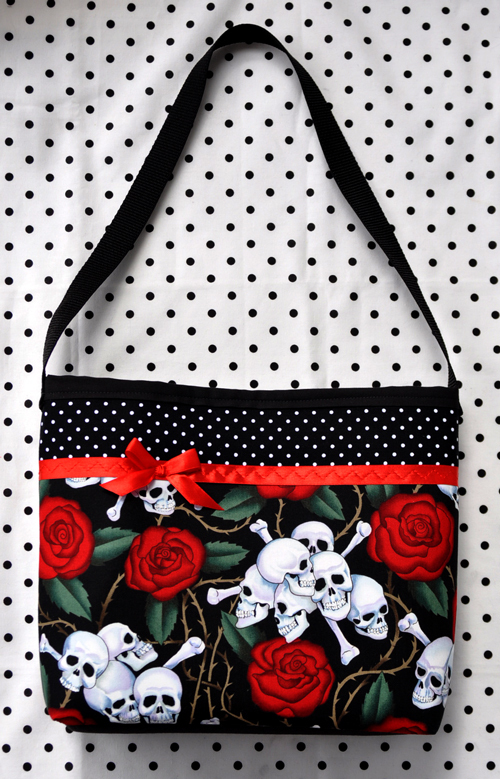 Black and white polka dots fabric and a red satin ribbon trim and bow compliment the skulls and roses.